OVO (pronounced: oh-voh) is described as a headlong rush into a colorful ecosystem teeming with life, where insects work, eat, crawl, flutter, play, fight and look for love in a non-stop riot of energy and movement. The insects' home is a world of biodiversity and beauty filled with noisy action and moments of quiet emotion. 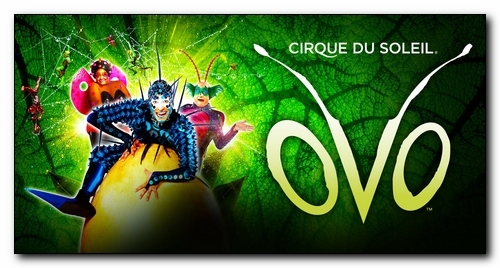 In fact, the name OVO means “egg” in Portuguese. This timeless symbol of the life cycle and birth of numerous insects represents the underlying thread of the show. And you’ll see some of this insect influence graphically, as OVO hides an insect in its name: the two letter "O’s" represent the eyes while the letter "V" forms the nose. It’s a concept that permeated throughout the entire design aesthetic of the show – in the set and stage the artists would dance upon to the costumes each of them would wear throughout the performance. When a mysterious egg appears in their midst, the insects are awestruck and intensely curious about this iconic object that represents the enigma and cycles of their lives. And it’s love at first sight when a gawky, quirky insect arrives in this bustling community and a fabulous ladybug catches his eye – and the feeling is mutual. This hidden, secret world at our feet is revealed as tender and torrid, noisy and quiet, peaceful and chaotic. And as the sun rises on a bright new day the vibrant cycle of insect life begins anew!